Like last week’s episode, ‘Sweet Tooth’ is hindered by attempts to keep the sisters in the dark, while the audience watch on in frustration. Though those narrative constraints are intentionally overt rather than thinly veiled in this instance, the episode lacks any kind of mystery to keep those watching in suspense; we know from the get-go who’s been murdering borderline offensive stereotypes around the Hillowne campus. In a lot of cases this kind of narrative can work wonders (take Cole's role in the OG version, for instance), but the weaker links in this episode make it feel misused. Of the many reboots to crop up over the past decade or so, this "re-imagining" of Charmed got to me the most; thanks in no small part to how much the OG version meant to me growing up. How could a new CW-ified version ever re-capture the magic of the late 90's WB series? Who could ever come close to replacing the Halliwells? In truth, those were probably the wrong questions to ask. There’s plenty about the original that could do with updating for a modern audience, not the least of which is the white-washed cast that was typical of a network show in the 1990’s. As this premiere drew closer, my concerns evolved into one simple request: that this new group of producers "get" what made Charmed so special. It was a flawed show, to be sure, but underneath it all it was a simple story about three imperfect but relatable sisters just trying to get by. Based on the promo material, it seemed like this version was much more concerned about using the story of the Charmed Ones as a vehicle for on-the-nose political commentary, and well-intentioned, yet overt feminism. Where was the family dynamic that sparked the OG version into the powerhouse it became? Despite this, I remained open-minded going into this pilot, and I was pleasantly surprised with how much this opening chapter got right. It was clunky in places, and the real-world parallels were a bit heavy handed, but its biggest flaws feel like they could be easily ironed out as the series finds its footing. We start the Veras' story with sisters Mel and Maggie in a similar place to the Halliwells back in the day, with a few major differences. The first of these is that it’s the death of their mother Marisol, not their Grams, that kicks of the chain of events that lead to them receiving their magical birthright. The second different is that Marisol dies under mysterious circumstances, unlike Penny Halliwell who succumbed to old age and ill health. The third change - and this is a big one – is eldest sibling Macy entering the series as Mel and Maggie’s long-lost half sister, an element that didn’t come into the original until Paige’s introduction in Season Four following Prue’s death. It’s interesting that the producers would chose to start the series off this way. Though it does lend itself to a much stiffer dynamic between the sisters without a pre-established history already in place, we do get to see the show explore the tightening of the sisters’ bond in a more challenging way. Macy is not only throwing Mel’s role as the eldest sibling out the window, she’s also a complete stranger who is suddenly a huge part of Mel and Maggie’s lives. The script doesn’t shy away from this element either, as Macy is met with immediate hostility from former big sister Mel. Though that hostility does dissipate by the close of the episode, it’s clear there will be a lot more teething issues between them further down the line. One of the smarter switch-ups of the pilot is the concept of each of the girls’ abilities tying into their personalities, abilities that come to fruition once the trio are reunited under the same roof following Macy’s arrival. The original had the girls’ powers controlled by their emotions, with their abilities going into overdrive during more tumultuous times. It was an element that fostered some wonderful character driven material, and this version takes it a step further, something this series can only benefit from. Macy is a scientist, so naturally her power of telekinesis is bolstered by her strong mind. I wasn’t sold on Medeleine Mantock’s performance from the promotional material, but she surprised me throughout the episode, and Macy’s initial skepticism of all things magic felt genuine, as was her reason for eventually accepting her “witchly fate”; to get to know her sisters and to “figure out this whole witchcraft thing on a molecular level and get a freaking Nobel Prize”. Maggie’s ability to read minds supposedly comes from her innate sensitivity, which we do see in her more open and friendly reaction to Macy’s surprise appearance. It could also come from her “desperate insecurity”, which we also witness as she desperately attempts to fit in during a sorority rush party; behavior that’s all too common in a young person still trying to find their place. The best of these ties is Mel’s power to stop time being common with “control freaks”. She’s the least likable of the three sisters, though this is more of a symptom of the desperate emotional state she falls into for the majority of the hour, pushing away those who are trying to help and generally acting like an angry shrew. By the close of the episode her skittish behavior is broken down as she learns how to control her power; ironically her ability works when she’s not angry. As Maggie so eloquently put it; “your powers are judging you”. The fact that Mel's flaws are addressed in this way is satisfying, and indicates that the writers are at least aware of the more garish elements of the series, and could be open to improving them in future episodes. In general, the core cast are good but lack the immediate likability of the Halliwells. The same goes for their chemistry, which doesn’t have the same spark that made Prue, Piper and Phoebe such a delight to watch. These elements can only get better with time, and the pilot made it clear that the potential for a great dynamic is certainly there. It was a comfort to see the writers dedicate more than a few scenes to the three girls just getting to know each other as their lives start to descend into madness. Keeping the original grounded in the Halliwells' bond is what made it work at the worst of times, and those moments renewed my faith in this version's ability to do the same. 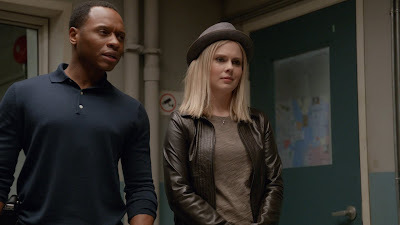 Outside of the sisters, the rest of the cast are largely interchangeable, though I get the impression that Rupert Evans’ whitelighter character Harry is going to be unpacked more in the coming episodes, particularly following that cliffhanger ending of the Ouija board warning the girls not to trust him. Evans is one of the better cast members, too, and his Giles-esque performance gives him an instant boost over the rest. Ellen Tamakai, who plays Mel’s girlfriend Nico is also a cute addition, as is the decision to make one of the sisters a gay woman, but Nico’s presence felt mostly like box ticking. Time will tell whether their relationship is a story worth telling beyond the LBGTQ element, though Nico’s role as a Hilltowne detective will inevitably cause some friction when the Veras get tangled up in the many unsolved crimes that are sure to plague their college town over the next while. Most of this pilot works, but one of the biggest missteps is the uneven humor which falls flat on more than a few occasions. Magic should be a mysterious, alluring and wonderful thing, but this script tends to lean into the comedic side of the girls new powers more times than it should, and a lot of the demonic confrontations feel more rooted in the absurdity of the situation rather than the seriousness of it. The girls are staring down death and the screaming and fumbling, however natural a reaction, was too over the top, and the stakes never felt raised. A tongue-in-cheek approach is always great in shows like this, but this new version feels like it’s pushing that side of things a bit too far. But like most of the other issues that are prevalent in this pilot, there’s an obvious learning curve, and there’s definitely time for it to work out kinks like this. I found the over reliance on present-day politics a little jarring, with characters like Mel throwing around lines about consent, and those oddly directed protest scenes feeling at odds with the girls learning to adjust to their new powers elsewhere. The decision to root the show’s core theme of sisterhood into modern day feminism is a clever one, but the not-so-subtle dig at the male patriarchy, and the relevant real-world threat they pose in this story felt a bit heavy handed. The show’s synopsis is important in that respect, as “tearing down the patriarchy” is not just symbolic of characters like Mel playing a huge role in on-campus protests against a professor accused of sexual assault, but is very much related to the demonic world as well, with the aforementioned faculty member actually representing the sisters’ first major demonic threat. This is the type of parallel that if overused could prove to be restrictive, but if the series learns to approach these kinds of themes with more subtlety, it could have the potential to be great. It’s also a nice change from the OG series which rarely took note of the real world outside of the Halliwells’ bubble. It's a relief to see the series use proper demonic appearances for the bad guys, as opposed to the trashy leather ensembles that became common place in the original. I liked how the girls coming together in the end actually looked, as Macy brought her sisters to her and they called on the Power of Three for the first time. The visuals are certainly on form in this version so far. Harry alerted the girls to the three signs of the apocalypse. -The first is when “the weakest of men reaches ill-gotten glory”: “Suffice to say, it’s your current president”. See what I mean about heavy handed? Funny, though. -The second sign is when “the movements’ great sages fall”; i.e. Marisol. A lot of the “funny” scenes didn’t land, but there were also a few that did, namely the ones that poked fun at how blunt Mel is. 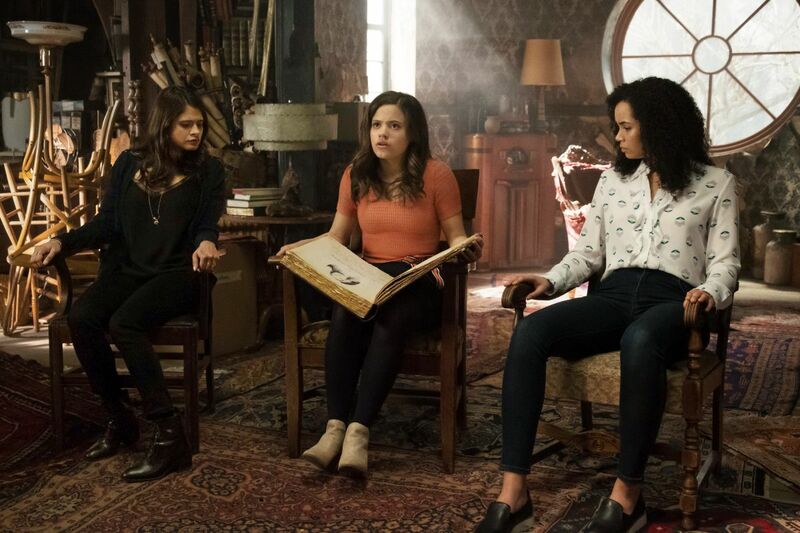 The “new” Book of Shadows references the girls’ ancestor Melinda Warren, something that’s common between both versions of the show. Despite its imperfections, this was a surprisingly fun start to a reboot that I initially had very little faith in. It laid some great groundwork for the show to explore, even justifying some of the changes that it’s made to the foundations of the original. Tonally it feels a little lost, but I’m more than willing to stick with this to see if it can craft an identity that not only respects the Charmed legacy, but allows this version to stand on its own feet. Also posted at Doux Reviews. iZombie 4.10: Yipee Ki Brain, Motherscratcher! In light of the "freakish" brains that have dominated the last few episodes, 'Yipee Ki Brain, Motherscratcher!' feels like a breath of fresh air, in that it leans on a less extreme personality to anchor the hour. As a whole, the episode fails to come together in a cohesive way, but there are a number of wonderful moments of genius sprinkled throughout to keep it from tanking completely. 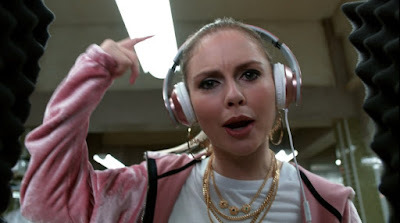 Opting for a lighter investigation that usual, 'Mac-Liv-Moore' uses a deluded white rapper's brain as fuel for more light-hearted side action as the episode's main focus falls on the wider narratives. Despite being plagued with potential ways to derail itself, the episode manages to cut through a lot of interesting story beats, with a few laughs along the way. 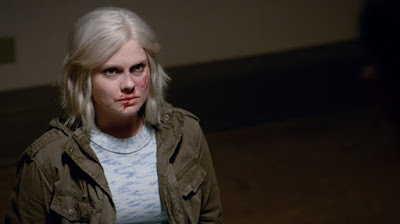 There's been a lot of noise this season about the brains being a little extreme in terms of the victims’ personalities overshadowing those of the zombies who have taken on said brains. We saw it in action in ‘Don’t Hate the Player...’ when a typically smart and thoughtful Liv turned into a narcissistic and obnoxious pig. Here the same problem persists, though Liv comes across as more of a nuisance than a complete a-hole with a LARPer at the wheel. But most importantly, she's still Liv. Season four started out in such a promising place. The new “world order” in Seattle was crammed full of story building potential. From the escalating brain shortages, to the ramifications of a city-wide quarantine, there were a million different possibilities for the series to explore. It became increasingly obvious over the second half of the season that the ambitious nature of such a wide scoping narrative was hard for a small series like iZombie to pull off. ‘And He Shall Be a Good Man’ is a mostly satisfying closer to this show’s biggest arc to date, though it suffers in the same way that many of the preceding episodes did in terms of trying to do too much with too little. Some of the issues prevalent in the previous episode are course corrected, here. The plotting was tighter, the characterization more affecting and what felt partially formed previously was far more integral this time around. I like to think I'm a critic, but really I'm just some loser with too much free time and a big mouth.